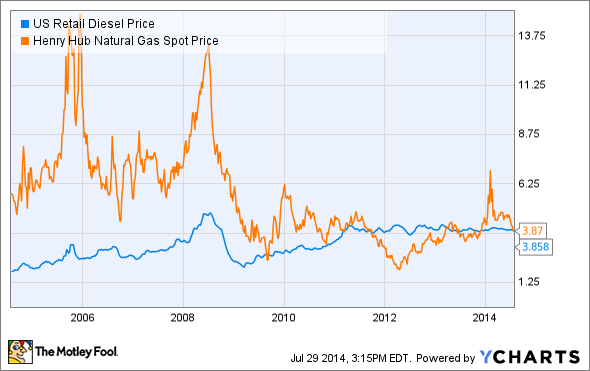 Is Warren Buffett Betting on Natural Gas Vehicles? Warren Buffett's Berkshire Hathaway owns significant interest in a number of businesses and also has subsidiaries that can benefit from the use of natural gas as a transportation fuel. It could also benefit from its stock positions in oil companies and industrial giant General Electric. Berkshire's MidAmerican Energy is heavily invested in alternative fuels. Will BNSF follow suit with LNG? Source: BNSF. The use of liquefied natural gas as an alternative fuel is a potential transformational change for our railroad and for our industry ... While there are daunting technical and regulatory challenges still to be faced, this pilot project is an important first step that will allow BNSF to evaluate the technical and economic viability of the use of liquefied natural gas in through-freight service, potentially reducing fuel costs and greenhouse gas emissions, thereby providing environmental and energy security benefits to our nation. Consider, on top of that, that Berkshire has more than $6 billion invested in companies heavily involved in natural gas production and distribution, and it's not a stretch to see Warren Buffett having reached the conclusion that domestic production of oil and natural gas will continue to be strong, and that natural gas will keep gaining traction as a transportation fuel. How big is this to Berkshire? There are two ways LNG can benefit the company: cost savings and profit opportunity. LNG locomotive. Source: CN Railways. Fuel expense was second only to compensation and benefits for BNSF in 2013, and at $4.5 billion is equal to a whopping 20.5% of BNSF's total revenues. While switching its diesel locomotive fleet to LNG isn't a simple matter, the long-term potential to reduce cost is significant. Natural gas is significantly less costly than diesel -- potentially 40% cheaper for a mass consumer like a railroad -- and the ability to shave literally billions of dollars off its operating expense makes it clear why BNSF is taking a hard look at LNG. BNSF isn't the only Berkshire company with substantial fuel expense. Subsidiary McLane Company employs 20,000 people and operates one of the largest vehicle fleets in North America, with more than 2,300 heavy trucks. With $45.9 billion in 2013 revenues, McLane is the largest of Berkshire's wholly owned subsidiaries by total sales. As noted in Berkshire's annual report, "McLane's grocery and foodservice businesses are marked by high sales volume and very low profit margins," so operational efficiency is a central tenet for McLane. Its efforts to date have included reducing the speed its trucks travel, as well as better loading methods in order to reduce the number of trips its trucks travel. McLane's fleet of 2,300 trucks is one of the largest in the United States. Source: Wikipedia. Based on some industry averages, McLane's annual diesel consumption is probably between 30 million and 60 million gallons, with annual fuel expense somewhere between $100 million and $225 million. That's a wide range, but Berkshire and McLane don't disclose these numbers. The figures are also dwarfed by the amount of fuel BNSF buys, but they're substantial next to McLane's before-tax profits of $483 million in 2013. A 20% reduction in fuel expense -- not unreasonable with a switch to natural gas -- could make a big difference in its profits. BNSF faces a number of serious challenges to adopting natural gas, including refueling infrastructure, the expense of replacing or converting locomotives, and regulatory approvals. The latter could be the biggest delay, as regulatory bodies can be slow to adopt changes. Nonetheless, natural gas for locomotives carries a number of benefits above and beyond the cost savings for the industry. As an almost entirely domestic resource, there is a lot of political goodwill, and every gallon of natural gas that replaces diesel will help reduce imports and put Americans to work. BNSF operates around 7,000 locomotives. These are long-lived assets (often 30-plus years in service), and over the past decade, BNSF has re-manufactured or replaced almost 6,000. In short, it will take years for BNSF to convert or replace a substantial portion of its fleet with LNG locomotives. Nonetheless, the opportunity is enormous, and the return -- because these are such long-lived assets -- could be significant. McLane has committed to updating its fleet of Class 8 tractors as well, with a stated goal of replacing 48% of its fleet in 2014. However, the company hasn't made a commitment to natural gas, counting instead on more efficient diesel engines to help it reduce its fuel costs and consumption. The Berkshire stock portfolio has almost $7 billion invested in companies throughout the natural gas value chain, ranging from ExxonMobil, the largest producer of natural gas in the U.S. through its ownership of XTO Energy, to oil and gas field services giant National Oilwell Varco, along with a small stake in General Electric. Each of these companies plays a significant role in natural gas production and distribution, while GE also plays a critical role as one of the largest locomotive manufacturers in the world. Each of these investments will be buoyed by the increased use of natural gas domestically and internationally as a transportation fuel, but it goes far beyond that. General Electric is also a key supplier of natural gas power-generation turbines, as well as liquefaction systems that facilitate the storage and transportation of natural gas globally. The Berkshire portfolio and subsidiary family both are filled with companies that have a stake in seeing natural gas for transportation gain traction, but this is a long story, and it's still the early chapters. As Buffett once said, "Someone is sitting in the shade today because someone else planted a tree a long time ago." It's going to take a number of years before the Berkshire subsidiaries start seeing the bottom-line improvements that natural gas can deliver. Durable advantage is something that Buffett has often talked about, and it's something that all of the companies Berkshire invests in -- or owns outright -- tend to have. If natural gas vehicles add to McLane or BNSF's competitive position, fully expect to see further adoption.